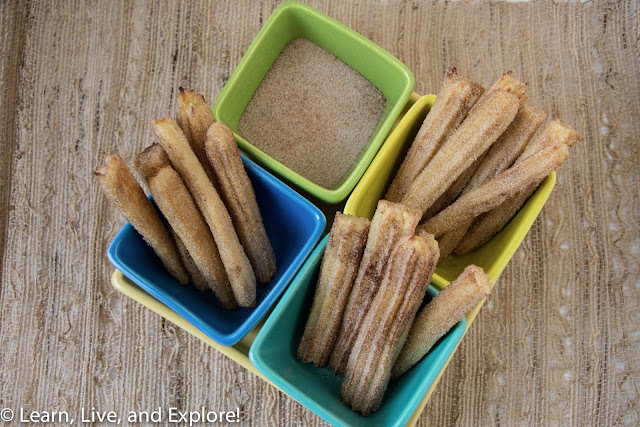 Churros for Cinco de Mayo ~ Learn, Live, and Explore! This is my last Cinco de Mayo themed baked good for this year...I think. 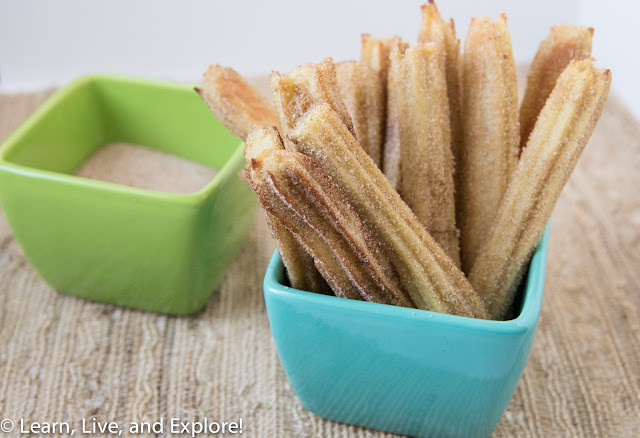 I saw a post by one of my favorite baking bloggers, Sprinklebakes, on how to make a "healthier" baked, not fried, churro. I knew I had to try my hand at making some because I love anything sprinkled with cinnamon and sugar. I didn't make any modifications to the recipe, so I'll just paste it in here. I did opt for the unsalted butter and not margarine, and I made mini churros instead of long sticks. By the way, if you haven't bought the Sprinklebakes book yet, I highly recommend it. It was one of my favorite book purchases last year!! And if you don't already follow her blog, again, I highly recommend that as well. Not only is she extremely talented in the kitchen, but her food photography is inspiring and drool-worthy. These are made as normal churros are - from choux paste. I've found that they are best when piped in long thin sticks. I use earth balance margarine in the batch pictured, but I also made a batch with unsalted butter that was successful - they just puffed up slightly larger than the margarine version. Overall, the baked version is less crisp than the usual fried churros, so it's important to toast them well under the broiler so they're as crisp as possible. You can store leftovers (if there are any) in an air-tight container but they will become rubbery. You can remedy this by placing them under the broiler for a few minutes (watch carefully) and they will regain their former crispiness. Serve with prepared dulce de leche, chocolate sauce, marshmallow fluff - they're good with everything! Pipe dough into long thin lengths on the parchment covered pans. Use a pair of kitchen scissors to cut the end of the dough from the piping tip. Leave about 2-inches of space between the churros. Transfer dough to a piping bag fitted with Ateco decorator tip #867. You could also pipe the dough in a zip-top bag with the corner snipped, but the churros will be ridge-less (delicious, nonetheless). Bake for 10-12 minutes or until slightly puffed. Turn oven to broiler setting and watch carefully as churros toast and turn deep golden brown. Remove from oven and let cool slightly. Transfer to a wire cooling rack. If you're baking the churros one pan at a time, be sure to return the oven setting to 425°F before putting in the next pan. Combine sugar and cinnamon and pour onto a long dish. Roll churros in mixture. Serve. Piping tip 867 made by Ateco (also known as French Star Size 7) is just about the most perfect tip for piping these churros. It has a 9/16 diameter opening. I experimented with a few and this made them just thick enough and produced the most prominent ridges. Add a pinch of cayenne pepper to the cinnamon-sugar mixture. Brings little heat and adds a faint smokiness. I had no problems with the cinnamon-sugar sticking to the hot churros, but if you let them cool to room temp they might resist the sugar. Brush churros with a tiny amount of olive oil using a pastry brush, then roll in the sugar mixture. As I said in the description, these will become soft and rubbery if stored in an air-tight container. Put them under the broiler (even if they've been rolled in cinnamon-sugar, this works!) they'll come back to life and crisp up under a watchful eye. Re-roll in cinnamon-sugar.